I don't know, it has a certain attraction. Here's a gallery of how somebody has arranged themselves in a cave. Is that a real cave? The photo looks like the Flintstone's house that you can see off the 605 freeway between San Jose and San Francisco. of a past lifetime - a LONG time ago. Except this one looks man-made all around. The attraction is being inside the earth (to a certain extent) and to have more of a regulated temperature inside, a little more protection from the elements, and I bet the acoustics are interesting. Mmhh, wait... there was no kitchen! ..and one wonders whether living in a cave automatically elevates the quality of one's life? beautiful cave dwellings that I've ever seen are in the Kun Lun mountains in China. Maybe I can scare up a photo or two. You will marvel at their beauty. "The revolution is at hand, and we must free ourselves of the chains of political and economic slavery. The nonviolent revolution is saying, "We will not wait for the courts to act, for we have been waiting hundreds of years. We will not wait for the President, nor the Justice Department, nor Congress, but we will take matters into our own hands, and create a great source of power, outside of any national structure that could and would assure us victory." For those who have said, "Be patient and wait!" we must say, "Patience is a dirty and nasty word." We cannot be patient, we do not want to be free gradually, we want our freedom, and we want it now. We cannot depend on any political party, for the Democrats and the Republicans have betrayed the basic principles of the Declaration of Independence." John Lewis, August 28, 1963, Washington D.C.
15 Aug 2005 @ 20:04 by bushman : Hmm, lol. Troglodytes, lol. Well, I would say the pics of this so called cave home, show that is clearly not a real cave, its just looks, a little papermachet and plaster. I've seen a couple man dug cave homes, and that guy that used to come on Art Bell show alot, forgot his nam, but he has a lavatube home in Hawaii. My design is easy and incorperates both worlds, simaler to a few new home out here where they used the back of a rock canyon as thier back 3 walls, allowing the water runoff to fall under the house, thats a little more involved, but is pretty cool natural stone walls and rocks inside. I would do something like that but dig it in more, just concreet and rebar, direct poured on balloons and packed tunnels, then just let dry , chisel out a doorway, gut the inside of its stuffing, and burry it., so all you would see is a planted dirt mound. Similar to this design, but with big huge slabs of rock leaned up on it and over it. iam living in hungary.recently bought an open soft stone mine.would like to create a cave house.would be happy with any information or photos. We live in a cave and think it is fantastic although it is a little bit more modern than the one in the photo. My suggestion is to check out www.cavesrus.com or www.caves-inland-andalucia.blogspot.com for plenty of ideas!! Thanks for the link Pebbles, much appreciated. 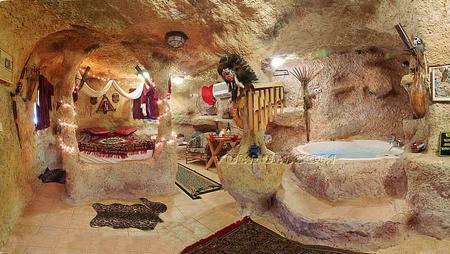 Our site Caves R Us is dedicated to all forms of cave living, and in fact anything to do with caves. Anyone can submit an article to be published on the site and all contributions are gratefully accepeted. If you wish to contribute please follow the links on the site, or if you have any comments or suggestions how the site could be improved, I am waiting to hear from you. The next time I read a blog, I hope that it does not disappoint me as much as this patclruiar one. I mean, I know it was my choice to read through, but I genuinely thought you would probably have something useful to say. All I hear is a bunch of crying about something that you can fix if you were not too busy searching for attention. The very next time I read a blog, Hopefully it does not fail me just as much as this one. I mean, Yes, it was my choice to read, hoeewvr I really believed you would probably have something useful to talk about. All I hear is a bunch of whining about something that you could possibly fix if you were not too busy searching for attention.